Abstract: This Geforce 7800GT comes completely silent right out of the box. The nVidia Geforce 7800GT graphics engine runs at 420MHz, and the GDDR3 memory follow suit with a clock speed of 1.24GHz (620MHz DDR3). 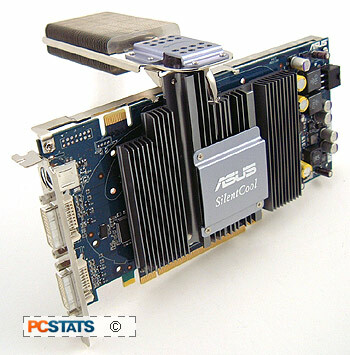 As you've already guessed, the Asus EN7800GT TOP Silent/2DHTV/256M videocard is based upon the reference GeForce 7800GT design. The Asus SilentCool heatsink boosts the cards' overall weight to a chunky 550 grams, so we'd advise you to firmly secure it to the computer chassis and click in the PCI Express x16 slot lock. Video In/Video Out (VIVO) is supported here, which is a nice treat that opens the door to multimedia and home theatre PC applications. The vendor includes a VIVO/Component Output box that hooks into the back of the card with a funky s-Video looking jack. A 150cm length of cable makes it possible to place the business end of this adaptor on top of the computer, or out of sight behind the AV gear. On the top right hand corner of the Asus EN7800GT TOP Silent is the required six pin 12V power connector. If the power supply in your computer doesn't natively support this kind of connector, there is a molex to 6-pin adaptor included. If you're only planing to run one Geforce 7800GT, you'll easily get away with a brand name PSU in the 450W range (with 26+ amps on the 12V rail). If you're eyeing a SLI Geforce 7800GT set up, double check to make certain your power supply has been certified by nVIDIA as okay for the task. The certified power supplies may cost a bit more than the non certified alternatives, but it's been our experience that reliability is well worth the price. PCSTATS has tested a couple power supplies that fall into this category, you can check them out here. Asus has a reputation on bundling a pile of software with its videocards, and that's the case with the Asus EN7800GT TOP Silent/2DHTV/256M. Included is a copy of PowerDirector, AsusDVD (PowerDVD with an Asus skin), Medi@ Show as well as full versions of the game King Kong, Chaos League, PowerDrome, Second Sight, Savage, Billy Blade: Temple of Time and Mashep. Those games will no doubt keep gamers busy for quite some time! While the overall package is very strong, it would have been nice if Asus could have included a second DVI to Analog converter as well. If you are determined to employ two analog monitors, you'll need that second jumper. We'd also like to see nVidia force its manufacturing partners to implement HDCP (High bandwidth Digital Content Protection ) support by default on compatible GPUs. The Asus EN7800GT TOP Silent/2DHTV/256M lacks this feature, and when DRM rears its ugly head users will have a difficult time playing high definition videos that are DRM enabled.